Behold the "Motorcycle Helmet of the Apocalypse"
This custom-built Brotherhood of Steel "motorcycle helmet of the apocalypse" won't do anything to protect your skull from a skid, but it sure will make you look good while you're roaring down the highway. There's a reason the Brotherhood of Steel is the poster boy for the Fallout series: because love it or hate it, there's no denying that power-armored paladins are the baddest-looking dudes in the wasteland. The Brotherhood helmet is one of the most iconic pieces of headgear in the history of videogames, so what could possibly be better than wearing your very own life-size, lifelike T-51b motorcycle helmet while you go blasting down the highway on your two-wheeled suicide machine? Not suffering a traumatic brain injury may leap to mind as one possibility, but that's not really a concern because this isn't really a motorcycle helmet. 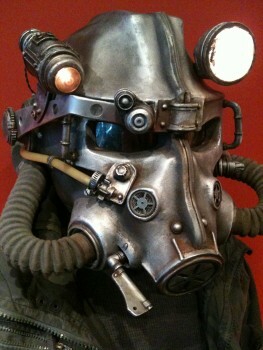 It's actually the creation of artist Josh Jay, who painstakingly handcrafted what has to be the hottest looking post-apocalyptic gear to come along since Ryan Palser brought the laser and plasma rifles to life back in 2009. The images came to light thanks to Her Majesty's Thunder, a clothing company dedicated to the principle of "Live Better, Ride British," but Jay, it turns out, is actually a level designer with Epic Games. Two sets of photos detailing the construction process can be found on his Facebook page. Safe? Not a chance. Ridiculously awesome? Absolutely.